This is where the best of the best strut their stuff. We give you a place to show the entire world your fish. Sunfish to Sailfish, we have it all. The young the old and the intergalactic. Check out the pictures of our friends around the world. "I wouldn't fish without Kick'n Bass® on whatever I was throwing." Rug-rat size and ankle biter's.
" Fisherkids, our next Kick'n Basser's "
Jason of Texas with a 8.5# caught with Guide John Robertson. Dustie Dees 4 years old and her first whopper, caught all by herself. Peter Preisinger, age 16 caught this huge 24.5 inch Bass from a private pond. Jeremy Smeltzer of NC with a fat 7# plus. Nice fish! Thomas Farmer 6 years old with a 17 inch bass. Tommy Ogle, 12 years old with a nice 7 pound plus bass. Michael with a 10# 6 oz Florida hog. Alexis and Sandy, part of the Kross family, Future Kick'n Bass® Pro Staff. Jonathan Thomas Alan Noah member of the Future Kick'n Bass® Pro Staff. Justine Faith Claypoole, proud grandfather, Big Al. Ashlynn Marie Swingle from the great state of Arizona, almost ready to fish! Austin James Noah, new future Kick'n Bass Pro. Fisherwomen from around the world. 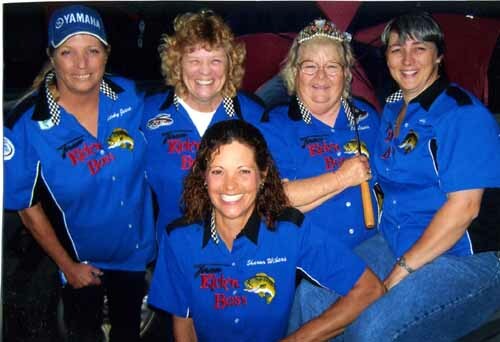 Bobbie Gayle Fisherwomen with a big Texas Hog, big fish! Kim Chambers "The Diva" with a fat Eufaula hog. 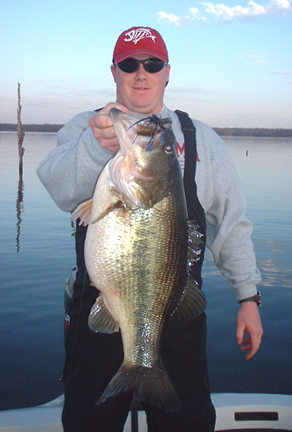 Joye Roberts with a fat 12 pound plus from Lake Fork Tx. Debbie Jones with a lunker from Lake Wheeler Alabama. Kathryn Gibson, Spring Hill, TN with a great 8 plus caught on a Jig and Pig with KNB. Toni Roberson with a 10.2 , her biggest so far. Fishermen from around the world. Brandon Moss from Ardmore, OK. caught on Kick'n Bass® Crawfish, the 4th Share a Lunker of the year in the state of Texas. It weighed 13.51 lbs. Darren "Mad Man Monneyham" and a 35# stringer caught on Man Man Craw/Worms. Terry Hollan of Reel Mexican Adventures and a nice 2002 Bass from Lake Huites, Mexico. Rene Salazar of Reel Mexican Adventures with a huge fish from Lake Baccarac, Mexico. John Shoemaker of Arizona with a nice Striped Bass out of Lake Pleasant. Ed Nassarre with two big channel cats. Russ Meier of Canada and a big Lake Erie largemouth. Mitch Fields with a big smallie. Rich was guided by Rick La Point of MO. Dr. Randy Estrada M.D. and some Mexican whoppers all caught on Kick'n Bass® garlic. Dr. Randy of Riverside CA with a 16# 15oz monster caught on Kick'n Bass® garlic. Dr. Fish with a 10# dink. caught on Kick'n Bass® garlic. Dr. Whopper and a 10# 5 oz! caught on Kick'n Bass® garlic. DR. Doctor, doctor! caught on Kick'n Bass® garlic. Paul Schlotfeldt with a 10 year old bass. Tall Paul Schotfeldt with a pair of nice MN bass. Tall Paul Schotfeld with a nice 7 plus hog caught on KNB. Benjamin Moody nice Bass in the trees. Alfred Rocha and a Bonelli Park Whopper. caught on Kick'n Bass® garlic. John Frescello a detective from Fl. with some big fish. caught on Kick'n Bass® garlic. Jesse Mc.Kee Amateur Tournament Fisherman and a nice bass and testimony. Ed Hernandes with a big float tube bass. Tim Turner at Lake Corpus Christi in Mathis, TX. Duane ( little man ) Parker, Mich. got to see this 22# Lake Trout! James Huggins. Caught these hogs on Lake Murray at Columbia, SC. Villa Del Pescador huge Dorado and some big largemouth's from Lake Huites. Steve Bozsi on a trip with Cosmic to Lake Alamo, nice bass. caught on Kick'n Bass® garlic. Phil Frecon with a 6# largemouth from a Secret Pond in New Jersey. Sid Ryan with a 14+ # bass from Imagination Bassin Guide Service. Troy Malmin with a huge Grouper shot with a spear while the grouper sniffed a bottle of KNB. Harry Morgan Editor of "Arizona Hunter and Angler" and his big fish award. Brett Visage and a couple of big Mexican Bass taken on lake Huites Mexico with KNB. Sidney Silberberg Professional Guide Service for California fresh and salt water. Dana Frauzel of Canada with a fat belly hog. Ron "Fishburn" Greig. With his 6 lb 8oz lunker caught in NJ. Clint Mitchell with a nice hog taken at Lake Fork on KNB. James Smith with big smallmouths and awards. Dave Ensminger with a nice 10 pound Mexican bass. Dave Lewis of Midlothian Texas caught this nice 10 lb. 4 oz. Cody Davis with a nice 4.2lb largemouth caught out of Lake Whitney Texas with the help of guide Les Parnell Jr.
Billy Brindle with KNB Pro Staff guide Steve Hacker and huge smallies and lot's of them! Matthew Wagner Saguaro Lake on 2/13/02. Weighed in at 8.0 pounds. Gary Clark with a huge Peacock Bass and a near World Record Piranha! 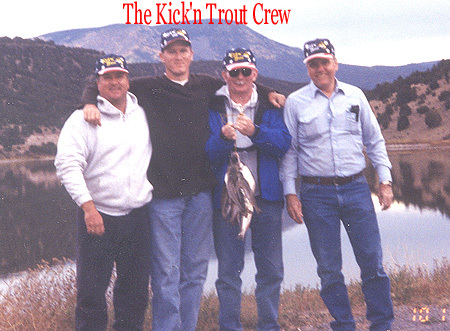 The Kick'n Trout crew from my wife's office in Arizona. Eric Walker From DES in Arizona with a huge bass caught on KNTrout! Willis "SNAGMAN" Beam with some nice Canadian Smallmouths caught on KNB Anise. Frank Wong of Canada with a nice haul of Eyes and Brown Bass on KNB. Stefano Lodi of Italy with a nice bass and some good pike on KNB. Brian Christiansen with a nice VA bass. Jimmie Jones 2 Time Superbowl Champion with his first 5 + pound bass. Jimmie Jones of the Dallas Cowboys now of the Kick'n Bass® Pro-Staff. Trap and Jimmy Houston at the 2001 Bass Master Classic® in LA.